O Prof. Dr. Leonardo Bonjardim estava preparando sua aula sobre epidemiologia e etiologia das disfunções temporomandibulares (DTMs) e eu dei uma espiada e pedi para disponibilizar aqui alguns dos dados. 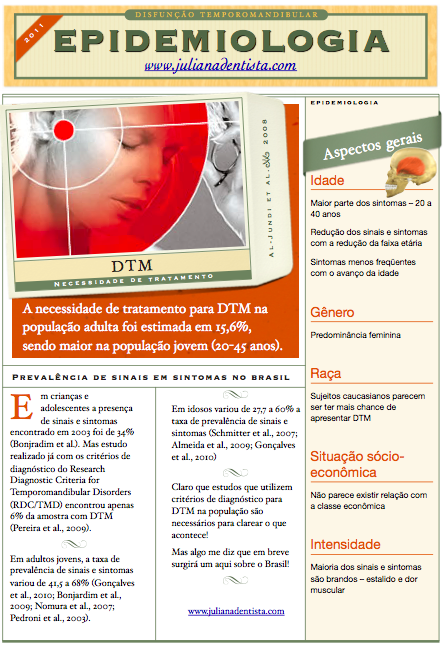 Esse post foi publicado em Disfunção Temporomandibular e marcado disfunção temporomandibular, DTM, epidemiologia. Guardar link permanente. Gostei da informação, e ainda mais por ler que os sintomas menos frequentes com o avanço da idade. 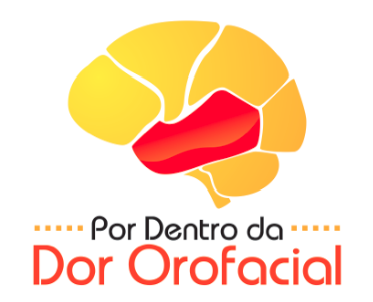 Sofro com o apertamento da mandíbula durante o sono (sem ranger de dentes) e acordo com dores na cabeça que irradiam para o pescoço e ombros. Quando estou com enxaqueca então… nossa! Qualquer informação é bem vinda! Parabéns! Speech in diagnosis of craniomandibular disorders. Plast Reconstr Surg;99(4): 1201, 1997 Apr. Head and neck lesions commonly found in musicians. J Am Dent Assoc;125(11): 1487-90, 1492-4, 1496, 1994 Nov.
Common problems in playing musical instruments include soft tissue lesions, tooth mobility, malocclusion, TMD and endodontic pathoses. This article illustrates the basic playing positions of the instruments and their effects on head and neck structures to help dentists provide appropriate diagnosis and treatment. Cranio. 1992 Jul;10(3):241-4. Musicians and temporomandibular disorders: prevalence and occupational etiologic considerations. Temporomandibular dysfunction (TMD) appears to be a significant problem affecting musicians. While the incidence of TMD symptoms for musicians is similar to that of the general population, these symptoms are activated and accentuated when performing or practicing. TMD symptoms appear to be significant in trombone, trumpet, tuba, violin, and viola musicians. It is the author’s opinion that vocalists are also significantly affected by TMD. Preliminary results of a survey in progress relative to TMD and the singing voice are reported. Temporomandibular disorders and the singing voice. The National Association of Singing Teachers Journal, 1994; 50: 3-14. Por gentileza,caso tenham possibildade de localização, ficaria muito grato.